I love butter cream icing; but when my son Benjamin requests coconut cake for his birthday, it’s not butter cream that I use. Many years ago I originally saw the recipe for boiled white icing in an old edition of the Settlement Cookbook . It looked rather complicated; but one day I experimented and found that it makes mounds of a creamy and delicious white icing. Over the years this icing has become the topping for not only my coconut cakes, but numerous other cupcakes and confections. I have topped it with coconut and every conceivable sweet candy I can think of. I often introduce food coloring into the white icing for presentation. This icing may not be as versatile or as easy to make as butter cream, but most definitely worth the effort and a try! Boil sugar and water over slow fire until the sugar spins a “thread”. It is a candy-making term that means the thread that appears between the spoon and the syrup when the spoon is lifted and turned. Refrigerate sugar water to cool it down. Pour the syrup very slowly into stiffly beaten egg whites. Beat until smooth and stiff enough to spread. 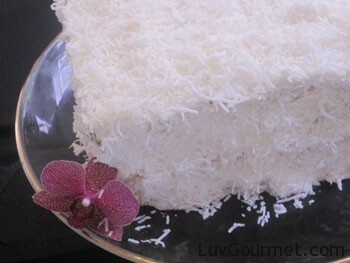 Spread on cake and sprinkle coconut chips over icing. Arrange racks in top and bottom thirds of oven; preheat to 350°. Coat cake pans with nonstick spray; dust with flour. Whisk 2 3/4 cups flour and next 3 ingredients in a medium bowl. Using an electric mixer, beat sugar and butter at medium speed, occasionally scraping down sides of bowl, until smooth, 3–4 minutes. Add eggs one at a time, beating to blend between additions. Beat until light and fluffy, 2–3 minutes. Beat in dry ingredients at low speed in 3 additions, alternating with buttermilk in 2 additions, beginning and ending with dry ingredients. Divide among four 9″ cake pans (about 2 generous cups batter per pan); smooth tops with a spatula. Bake until a tester inserted into center of cakes comes out clean, 22–27 minutes. Transfer pans to wire racks; let cool in pans for 5 minutes. Invert cakes onto racks, remove pans, and let cakes cool completely.